Swaminarayan (Gujarati: સ્વામિનારાયણ, Devanagari: स्वामीनारायण, IAST: Svāmīnārāyaṇa) (April 3, 1781 – June 1, 1830), also known as Sahajanand Swami, is the founder of the Swaminarayan Sampraday, a vibrant expression of contemporary Hinduism, in the Vaisnavite tradition. Swaminarayan was born Ghanshyam Pande in Chhapaiya, Uttar Pradesh, India in 1781. In 1792, he began a seven year pilgrimage across India, adopting the name Nilkanth Varni. He settled in the state of Gujarat around 1799. In 1800, he was initiated into the Uddhav Sampraday by his guru, Ramanand Swami, and was given the name Sahajanand Swami. In 1802, his guru handed over the leadership of the Uddhav Sampraday to him before his death. Soon after the death of his Guru Ramanand Swami, Sahajanand Swami held a gathering and taught the Swaminarayan mantra. From this point onwards, he was known as Swaminarayan and within the sect, he is regarded as an incarnation of God, Purushottama, or is venerated as an incarnation of Narayana from the Nara-Narayana deity pair by his followers. The Uddhav Sampraday became known as the Swaminarayan Sampraday. Swaminarayan built six temples in his lifetime and appointed 500 paramhansas to spread his philosophy. In 1826, Swaminarayan wrote the Shikshapatri, a book of social principles. He died on June 1, 1830 and was cremated according to Hindu rites in Gadhada, Gujarat. Before his death, Swaminarayan appointed his adopted nephews as acharyas to head the two primary dioceses of the Swaminarayan Sampraday. Importantly, Swaminarayan did a great deal to advance reforms for women and the poor, performing yajnas or fire sacrifices on a large scale as well as performing miracles. Swaminarayan had an estimated 1.8 million followers when he died. Currently, his following is estimated between 5 and 20 million. Swaminarayan was born on April 3, 1781 (Chaitra Sud 9, Samvat 1837) in Chhapaiya, Uttar Pradesh, a village near Ayodhya, in a Hindi speaking region in India. Born in the Brahmin or priest caste of Sarvariya, Swaminarayan was named Ghanshyam Pande by his parents, Hariprasad Pande (father, also known as Dharmadev) and Premvati Pande (mother, also known as Bhaktimata and Murtidevi). The birth of Swaminarayan coincided with the Hindu festival of Rama Navami, celebrating the birth of Rama. The ninth lunar day in the fortnight of waxing moon in the Hindu month of Chaitra (March–April), is celebrated as both Rama Navami and Swaminarayan Jayanti by Swaminarayan followers. This celebration also marks the beginning of a ritual calendar for the followers. Ghanshyam had an elder brother, Rampratap Pande, and a younger brother, Ichcharam Pande. 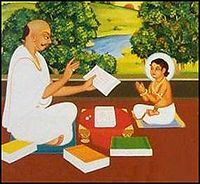 He is said to have mastered Hindu scriptures including the Vedas, the Upanishads, the Puranas, the Ramayana, and the Mahabharata by the age of seven. In 1848, when Ghanshyam was 10 years and 7 months old, his mother died, followed by his father seven months later. Just prior to his passing, Dharmadev took Gyansham to Kashi, the famous, ancient center of scriptural learning, also known as Benares, or Varanasi. Because Dharmadev was well known and deeply respected there, pundits from a broad range of traditions and philosophies gathered to offer respect and discuss dharma. Hagiograpic accounts report that 11 year old Gyansham engaged the pundits and was able to present so exquisite and rarified grasp of paradox and metaphysics that all present yielded to him in rapture. Soon after returning home to Ayodhya, Dharamdev died whereupon young Gyansham began his arduous, seven year journey of austerity and solitude. After the death of his parents, Ghanshyam Pande left his home on June 29, 1792 (Ashadh Sud 10, Samvat 1849) at the age of 11. He took the name Nilkanth Varni while on his journey. While on his journey, Nilkanth Varni mastered Astanga yoga (eightfold yoga) in a span of 9 months under the guidance of an aged yogic master named Gopal Yogi. In Nepal, it is said that he met King Rana Bahadur Shah and cured him of his stomach illness. As a result, the king freed all the ascetics he had imprisoned. Nilkanth Varni visited the Jagannath Temple in Puri as well as temples in Badrinath, Rameshwaram, Nashik, Dwarka and Pandharpur. In 1799, after a seven year journey, Nilkanth's travels as a yogi eventually came to an end in Loj, a village in the Junagadh district of Gujarat. There, Nilkanth Varni met Muktanand Swami, a senior disciple of Ramanand Swami. Muktanand Swami, who was twenty-two years older than Nilkanth, answered the five questions to Nilkanth's satisfaction. Nilkanth decided to stay for the opportunity to meet Ramanand Swami, whom he met a few months after his arrival in Gujarat. Nilkanth Varni received sannyasa initiation from Ramanand Swami on October 20, 1800, and with it was granted the names Sahajanand Swami and Narayan Muni to signify his new status. At the age of 21, Sahajanand Swami was appointed by Ramanand Swami to be his successor, and to lead the Uddhav Sampraday by Ramanand Swami. This was just prior to the death of Ramanand Swami. 14 days later, Sahajanand Swami introduced the Swaminarayan mantra, and thereafter, the Uddhav Sampraday henceforth came to be known as the Swaminarayan Sampraday. Sahajanand Swami at this point was now known as Swaminarayan after the mantra he taught at this gathering, in Faneni, two weeks after the death of Ramanand Swami. He gave his followers a new mantra, known as the Swaminarayan mantra, to repeat in their rituals: Swaminarayan. When chanting this mantra, some devotees are said to have entered samadhi (a form of meditation) This act is also called maha-samadhi ("great samadhi") and claimed that they could see their personal gods, even though they had no knowledge of Astanga Yoga. According to sources he proclaimed the worship of one sole deity, Krishna or Narayana. He declared Krishna to be his ista devata. Swaminarayan also is known by the names Ghanshyam Maharaj, Shreeji Maharaj, Hari Krishna Maharaj, and Shri Hari. As early as 1804, Swaminarayan, who was reported to have performed miracles, was described as a manifestation of God in the first work written by a disciple and paramhansa, Nishkulanand Swami. 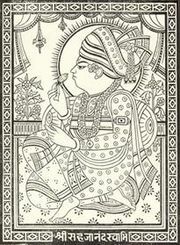 This work, the Yama Danda, was the first piece of literature written within the Swaminarayan sect. In contrast with the other main Vaishnava sect, the Radha-vallabha Sampradaya, Swaminarayan introduced a more puritanical approach, departing from the predominant teachings that views Krishna as capricious in character. Swaminarayan worshipped Krishna devotedly, but rejected any licentious elements occasionally found in Krishnology. For Swaminarayan the mood of worship was one of majesty, more akin to to the earlier Vaisnava teachers, Ramanuja and Yamunacarya. Swaminarayan stated that four elements need to be conquered for ultimate salvation: dharma, bhakti (devotion), gnana (knowledge) and vairagya (detachment). Doctrinally, Swaminarayan was close to eleventh century philosopher Ramanuja and was critical of Shankaracharya's concept of advaita, or monistic non-dualism. Swaminarayan's ontology maintained that the supreme being is not formless and that God always has a divine form. Swaminarayan encouraged his followers to combine devotion and dharma to lead a pious life. Using Hindu texts and rituals to form the base of his organization, Swaminarayan founded what in later centuries would become a global organisation with strong Gujarati roots. He was particularly strict on the separation of sexes in temples. Swaminarayan was against the consumption of meat, alcohol or drugs, adultery, suicide, animal sacrifices, criminal activities and the appeasement of ghosts and tantric rituals. Alcohol consumption was forbidden by him even for medicinal purposes. Many of his followers took vows before becoming his disciple. From early on, ascetics played a major role in the Swaminarayan sect. They contribute towards growth and development of the movement to this day, encouraging people to follow a pious and religious life. Tradition maintains that Swaminarayan initiated 500 ascetics as paramhansas in a single night. Paramhansa is a title of honor sometimes applied to Hindu spiritual teachers who are regarded as having attained enlightenment. Paramhansas were the highest order of sannyasi in the sect. Prominent paramhansas included Muktanand Swami, Gopalanand Swami, Brahmanand Swami, Gunatitanand Swami, Premanand Swami, Nishkulanand Swami, and Nityanand Swami. Swaminarayan held the Bhagavata Purana in highest honor and authority. However, there are many texts that were written by Swaminarayan and his followers that are regarded as shastras or scriptures within the Swaminarayan Sampraday. Notable scriptures throughout include the Shikshapatri and the Vachanamrut. Other important works and scriptures include the Satsangi Jeevan, Swaminarayan's authorized biography, the Muktanand Kavya, the Nishkulanand Kavya and the Bhakta Chintamani. Swaminarayan wrote the Shikshapatri on 11 February 1826. and was translated into Gujarati by Nityanand Swami under the direction of Swaminarayan. The Shikshapatri is a book of spiritual and social laws that members of the Sampraday should follow. Essentially, it is a commentary on the practice and understanding of dharma. It is a small booklet containing 212 Sanskrit verses that outline the basic tenets that Swaminarayan taught his followers to uphold so as to live a well-disciplined and moral life. The oldest copy of this text is preserved at the Bodleian Library of Oxford University and it is one of the very few texts written by Sahajanand Swami himself. Swaminarayan's philosophical, social and practical teachings are contained in the Vachanamrut, a collection of dialogues recorded from his spoken words by five followers. The Vachanamrut is the scripture most commonly used by Swaminarayan devotees. It contains views on dharma (moral conduct), jnana (understanding of the nature of the self), vairagya (detachment from material pleasure), and bhakti (pure, selfless devotion to God), as well as on the four essentials that Hindu scriptures describe as necessary for a jiva (soul) to attain moksha (salvation). After assuming the leadership of the Sampraday, Swaminarayan worked to assist the poor by distributing food and drinking water. He undertook several social service projects and opened almshouses for the poor. According to his biographer Raymond Brady Williams, "Swaminarayan is an early representative of the practice of advocacy of women's rights without personal involvement with women". To counter the practice of sati (self-immolation by a widow on her husband’s funeral pyre), Swaminarayan argued that, as human life was given by God it could be taken only by God, and that sati had no Vedic sanction. He went to the extent to call sati nothing but suicide. Swaminarayan offered parents help with dowry expenses to discourage female infanticide, calling infanticide a sin. At that time, influential and wealthy individuals educated their girls through private and personal tuition. Male followers of Swaminarayan made arrangements to educate their female family members. The literacy rate among females began to increase, and they were able to give discourses on spiritual subjects. Within the sect, Swaminarayan is considered a pioneer of education of females in India. Swaminarayan was against animal sacrifices that used to be carried out by Brahmin priests during Vedic rituals, such as yajnas (fire sacrifices), influenced by the Kaula and Vama Marg cults. The priests consumed "sanctified" prasad in the form of meat of these animals. To solve this problem, Swaminarayan conducted several large scale yajnas involving priests from Varanasi. These did not have animal sacrifices and were conducted in strict accordance with Vedic scriptures. Swaminarayan was successful in reinstating ahimsa through several such large scale yajnas. Swaminarayan stressed lacto vegetarianism among his followers and forbade meat consumption. Disciples of Swaminarayan composed devotional poems which are widely sung by the tradition during festivals. Swaminarayan introduced fasting and devotion among followers. He conducted the festivals of Vasant Panchami, Holi, and Janmashtami with organization of the traditional folk dance raas. Some suggest that Swaminarayan worked towards ending the caste system, allowing everyone into the Swaminarayan Sampraday. However partaking in the consumption food of lower castes and caste pollution was not supported by him. A political officer in Gujarat, Mr. Williamson, reported to Bishop Herber that Swaminarayan had "Destroyed the yoke of caste." He instructed his paramhansas to collect alms from all sections of society and appointed people from the lower strata of society as his personal attendants. Members of the lower castes were attracted to the movement as it improved their social status. It is said that Swaminarayan dispelled the myth that moksha (liberation) was not attainable by everyone. He taught that the soul is neither male nor female and that everyone was equal in the eyes of God. Swaminarayan ordered the construction of several Hindu temples and installed the images of various deities such as Nara-Narayana, Laxminarayan, Radha Krishna, Radha Ramana and Revati-Baldevji. The images in the temples built by Swaminarayan provide evidence of the priority of Krishna. The first temple Swaminarayan constructed was in Ahmedabad in 1822, with the land for construction gifted by the British Imperial Government. 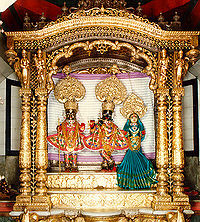 Following a request of devotees from Bhuj, Swaminarayan asked his follower Vaishnavananand Swami to build a temple there. Following planning, construction commenced in 1822, and the temple was built within a year. A temple in Vadtal followed in 1824, a temple in Dholera in 1826, a temple in Junagadh in 1828, and a temple in Gadhada, also in 1828. By the time of his death, Swaminarayan had also ordered construction of temples in Muli, Dholka and Jetalpur. In 1822, The first Swaminarayan Mandir was constructed on the land granted by the British Imperial Government in Ahmedabad. Swaminarayan strove to maintain good relationships with people of other religions. His biography is full of constructive encounters with prominent leaders of all traditions. His followers cut across religious boundaries, including people of Muslim and Parsi backgrounds. Swaminarayan's personal attendants included Khoja Muslims. In Kathiawad, many Muslims wore kanthi necklaces given by Swaminarayan. He also had a meeting with Reginald Heber, Lord Bishop of Calcutta and a leader of Christians in India at the time. Bishop Heber mentions in his account of the meeting that about two hundred disciples of Swaminarayan accompanied him as his bodyguards mounted on horses carried Matchlocks and swords. Bishop Heber himself had about a hundred horse guards accompanying him (fifty horses and fifty muskets) and mentioned that it was humiliating for him to see two religious leaders meeting at the head of two small armies, his being the smaller contingent. As a result of the meeting, both leaders gained mutual respect for one another. Swaminarayan enjoyed a good relationship with the British Imperial Government. 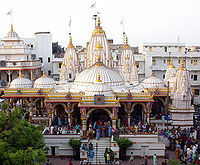 The first temple he built, in Ahmedabad, was built on 5,000 acres (20 km²) of land gifted by the government. The British officers gave it a 101 gun salute when it was opened. It was in an 1825 meeting with Reginald Heber that Swaminarayan is said to have intimated that he was a manifestation of Krishna. In 1830, Swaminarayan had a meeting with Sir John Malcolm, Governor of Bombay (1827 to 1830). According to Malcolm, Swaminarayan had helped bring some stability to a lawless region. During the meeting with Malcolm, Swaminarayan gifted him a copy of the Shikshapatri. This copy of the Shikshapatri is currently housed at the Bodleian Library at University of Oxford. 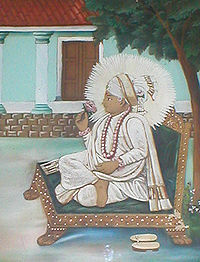 Swaminarayan also encouraged the British Governor James Walker to implement strong measures to stop the practice of sati. In 1830, Swaminarayan gathered his followers and announced his departure. 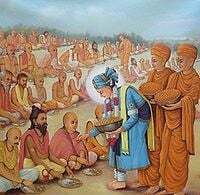 He died on June 1, 1830 (Jeth sud 10, Samvat 1886), and it is believed by followers that, at the time of his death, Swaminarayan left Earth for Akshardham, his abode. He was cremated according to Hindu rites at Lakshmi Wadi in Gadhada. 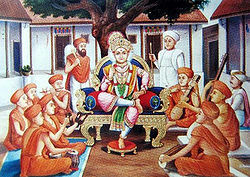 Prior to his death, Swaminarayan decided to establish a line of acharyas or preceptors, as his successors. He established two gadis (seats of leadership). One seat was established at Ahmedabad (Nar Narayan Dev Gadi) and the other one at Vadtal (Laxmi Narayan Dev Gadi) on November 21, 1825. Swaminarayan appointed an acharya to each of these gadis to pass on his message to others and to preserve his fellowship, the Swaminarayan Sampraday. These acharyas came from his immediate family after sending representatives to search them out in Uttar Pradesh. He formally adopted one son from each his brothers and later appointed them to the office of acharya. 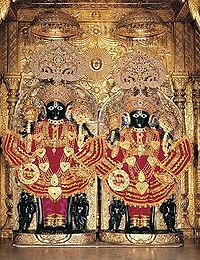 Ayodhyaprasad, the son of Swaminarayan's elder brother Rampratap and Raghuvira, the son of his younger brother Ichcharam, were appointed acharyas of the Ahmedabad Gadi and the Vadtal Gadi respectively. Swaminarayan decreed that the office should be hereditary so that acharyas would maintain a direct line of blood descent from his family. The administrative division of his followers into two territorial dioceses is set forth in minute detail in a document written by Swaminarayan called Desh Vibhaag Lekh. Decades after his death, several divisions occurred with different understandings of succession. Some of these include the establishment of Bochasanwasi Shri Akshar Purushottam Swaminarayan Sanstha (BAPS), the founder of which left the Vadtal Gadi in 1905, and Maninagar Swaminarayan Gadi Sansthan, the founder of which left the Ahmedabad Gadi in the 1940s. The Swaminarayan Sampraday view these breakaway organization's as vimukh (against the source). The followers of BAPS hold Gunatitanand Swami as the spiritual successor to Swaminarayan, asserting that on several occasions Swaminarayan revealed to devotees that Gunatitanand Swami was Aksharbrahm manifest. Followers of BAPS believe that the acharyas were given administrative leadership of the sect while Gunatitanand Swami was given spiritual leadership by Swaminarayan. The current leader of BAPS is Pramukh Swamiji, who also assumes the status of the original acharyas, thus not only the spiritual head, but the one responsible for the administrative needs of the Sampraday as well. The followers of the Maninagar Swaminarayan Gadi Sansthan hold Gopalanand Swami as the successor to Swaminarayan. The current leader of this sect is Purushottampriyadasji Maharaj and also shares dual roles of spiritual and administrative duties. Nara Narayana installed by Swaminarayan in the first Swaminarayan Temple, Ahmedabad. According to the biographer Raymond Williams, when Swaminarayan died, he had a following of 1.8 million people. In 2001, Swaminarayan centers existed on four continents, and the congregation was recorded to be five million, the majority in the homeland of Gujarat. In his discourses recorded in the Vachanamrut, Swaminarayan mentions that humans would not be able to withstand meeting god in his divine form, hence God takes human form (simultaneously living in his abode) so people can approach, understand and love him in the form of an Avatar. While no detailed statistical information is available, most of the followers of Swaminarayan share a belief that Swaminarayan is the complete manifestation of Narayana or Purushottam Narayana - the Supreme Being and superior to other avatars. Some of Swaminarayan's followers believe he was an incarnation of god Krishna. The images and stories of Swaminarayan and Krishna have coincided in the liturgy of the sect. The story of the birth of Swaminarayan parallels that of Krishna's birth from the scripture Bhagavata Purana. Swaminarayan himself is said to have intimated that he was a manifestation of God in a meeting with Reginald Heber, the Lord Bishop of Calcutta, in 1825. Despite his great and visionary reforms for women, many believe that Swaminarayan's actions have led to an enduring form of patriarchy that shows itself in various forms in the contemporary community. The movement at present restricts women and makes gender equality in the organization's leadership impossible. No women are trustees of the religion nor do they serve on any managing committees of the major temples. Thus all the wealth and institutions are effectively under the control of men. Additional critiques obtain especially from strongly feminist individuals and groups. Others criticize the group similarly, claiming that the dissolution of caste was not fully and consistently addressed. These include pointing out that Swaminarayan would eat along with the Rajput and Khati castes but not any lower. He established separate places of worship for the lower population where they were considerable. In the Shikshapatri, he wrote do not take food or water from a person of a lower caste. Members of a lower caste are prohibited from wearing a full sect mark (tilak chandlo) on their forehead. Several decades after formation of the movement, Swami Dayananda (1824–1883) questioned the acceptance of Swaminarayan as the Supreme Being and disapproving towards the idea that visions of Swaminarayan could form a path to attaining perfection. Swaminarayan was criticized because he received large gifts from his followers and dressed and traveled as a Maharaja even though he had taken the vows of renunciation of the world. It is always the case that someone somewhere always will feel critical about religion, its leaders, and communities. Swaminarayan, and the Swaminarayan Sampraday is no exception. He has been accused of deviating from the Vedas, and his followers were criticized for the illegal collection of wealth. Criticism might be legitimate in areas, and where so, one hopes for steady reform. It should not however overshadow the enormous influence of Swaminarayan and the movement that grew from his small beginnings. Modern day believers are felt by many to be upright, conscientious, and stable in their blend of spiritual and practical life. ↑ 1.0 1.1 Raymond Brady Williams, An Introduction to Swaminarayan Hinduism (Cambridge University Press, 2001, ISBN 978-0521654227), 13. ↑ Manju Gupta, Let's Know Hindu Gods and Goddesses (Star Publications, 2007). ↑ Life Biography Shree Swaminarayan Gurukul Rajkot. Retrieved August 7, 2013. ↑ Sadhu Vivekjivandas, Bhagwan Swaminarayan: Life and Work (Swaminarayan Aksharpith, 2007, ISBN 978-8175263222). ↑ 6.0 6.1 Penance and Pilgrimage Life Biography, Shree Swaminarayan Gurukul Rajkot. Retrieved August 7, 2013. ↑ 8.0 8.1 Williams (2001), 36. ↑ 9.0 9.1 9.2 9.3 9.4 9.5 Dinkar Joshi, Glimpses of Indian Culture (Star Publications, 2005, ISBN 978-8176501903), 92–93. ↑ Gujarat (India), Gujarat State Gazetteers (Bhavnagar: Directorate of Govt. Print., Stationery and Publications, 1969), 577. ↑ Williams (2001), 16, 17. ↑ 13.0 13.1 13.2 13.3 13.4 13.5 Williams (2001), 17. ↑ 14.0 14.1 Williams (2001), 240. ↑ Anil Kumar Sarkar, Yoga, Mathematics, and Computer Sciences: In Change Confronting the Dawn of the Twenty-first Century (New Delhi: South Asian Publishers, 1997, ISBN 978-8170032045), 53. ↑ The word "samadhi" has different meanings in Hinduism. It may refer to a form yogic deep meditation. As a cause of death, it refers to the act of consciously and intentionally leaving one's body at the time of death. ↑ Kirin Narayan, Storytellers, Saints and Scoundrels (Motilal Banarsidass Publ., 1992, ISBN 978-8120808904), 141. ↑ 19.0 19.1 19.2 Robert Vane Russell and R.B.H. Lai, Tribes and Castes of the Central Provinces of India. Asian Educational Services, 1995. ISBN 978-8120608337). ↑ Takashi Shinoda, The other Gujarat (Popular Prakashan, 2002, ISBN 978-8171548743), 9. ↑ Williams (2001), 17, 76, 189. ↑ Guy L. Beck (ed. ), Alternative Krishnas: Regional And Vernacular Variations On A Hindu Deity (SUNY Press, 2005, ISBN 978-0791464151). ↑ Russell Foster Aldwinckle, More than Man: A Study in Christology (Grand Rapids, MI: Eerdmans, 1976, ISBN 978-0802834560). ↑ 24.0 24.1 24.2 Carl Olson, The many colors of Hinduism: a thematic-historical introduction (Rutgers University Press, 2007, ISBN 978-0813540689), 336. ↑ 26.0 26.1 26.2 Rohit Barrot, "Caste and sect in Swaminaran Movement." In Richard Burghart (ed. ), Hinduism in Great Britain (Routledge, 1987, ISBN 978-0422609104), 67–70. ↑ 28.0 28.1 28.2 28.3 28.4 M.G. Chitkara, Hindutva (APH Pub. Corp., 1997, ISBN 978-8170247982), 227–228. ↑ Williams (2001), 187, 189. ↑ Julius Lipner, Hindus: Their Religious Beliefs and Practices (Routledge, 2010, ISBN 978-0415456777). ↑ 33.0 33.1 Williams (2001), 187–190. ↑ Raymond Williams, Presentation of the Shikshapatri to Sir John Malcolm Digital Shikshapatri. Retrieved August 12, 2013. ↑ K. Ayyappapanicker, Medieval Indian Literature: Surveys and selections (Sahitya Akademi, 1997, ISBN 978-8126003655), 130–131. ↑ Times Music cassette on Swaminarayan serial launched Times of India, January 19, 2002. Retrieved August 12, 2013. ↑ 38.0 38.1 Williams (2001), 169. ↑ 39.0 39.1 Williams (2001), 165, 167. ↑ 40.0 40.1 Martha Craven Nussbaum, The clash within (Harvard University Press, 2007, ISBN 978-0674024823), 322, 323. ↑ Swaminarayan's Life - Biography: Uplift of Women www.swaminarayan.org. Retrieved August 12, 2013. ↑ 42.0 42.1 42.2 M.M. Rahman, Encyclopaedia of Historiography (Anmol Publications PVT. LTD, 2006, ISBN 978-8126123056), 145, 146. ↑ 43.0 43.1 Christopher John Fuller, The camphor flame (Princeton University Press, 2004, ISBN 978-0691120485), 171. ↑ Williams (2001), 24, 159. ↑ Prema A. Kurien, A Place at the Multicultural Table: The Development of an American Hinduism (Rutgers University Press, 2007, ISBN 978-0813540566), 105. ↑ Raymond Brady Williams, Williams On South Asian Religions And Immigration: Collected Works (Ashgate Pub. Ltd, 2004, ISBN 978-0754638568), 162. ↑ Williams (2001), 57, 77. ↑ 50.0 50.1 50.2 50.3 Williams (2004), 81. ↑ 52.0 52.1 52.2 Swaminarayan Temples Shri Swaminarayan Temple (ISSO OF CHICAGO). Retrieved August 12, 2013. ↑ 53.0 53.1 The foundations of devotion Asia Africa Intelligence Wire (from The Times of India), March 04, 2003. Retrieved August 12, 2013. ↑ 54.0 54.1 54.2 Williams (2001), 29. ↑ Behramji Merwanji Malabari, Gujarat and the Gujaratis (Asian Educational Services, 1997, ISBN 978-8120606517), 263–269. ↑ 57.0 57.1 Williams (2001), 69. ↑ 61.0 61.1 61.2 Williams (2001), 34–36. ↑ 62.0 62.1 Williams (2001), 35–37. 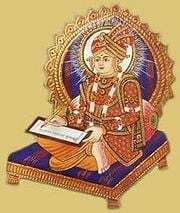 ↑ Swaminarayan Overview Of World Religions. Retrieved August 12, 2013. ↑ Acharya Swamishree Purushottampriyadasji Maharaj Guruparampara. Retrieved August 12, 2013. ↑ Shikshapatri Verse 34. Retrieved August 12, 2013. ↑ 70.0 70.1 S.G. Shatanand Muni, Shikshapatri Bhashya (Shri Swaminarayan Temple, 2002). Retrieved August 12, 2013. ↑ Kirin Narayan, Storytellers, Saints, and Scoundrels: Folk Narrative in Hindu Religious Teaching (University of Pennsylvania Press, 1989, ISBN 978-0812212693). All links retrieved May 12, 2014. This page was last modified on 8 September 2015, at 15:43.